Half Day (Duration: 03hrs. and 30mins. approx. Duration: Half Day (Duration: 03hrs. and 30mins. approx. On this half day tour you will visit Oviedo Cathedral, Historic Quarter and Pre-Romanesque Monuments on Naranco Hill. 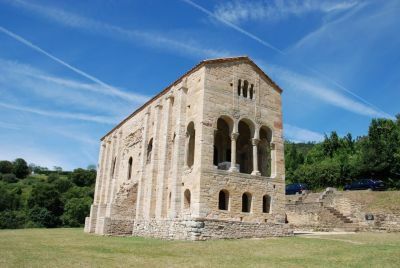 A pre-Romanesque architectural monument, lying on the slopes of mount Naranco and comprising of one of Oviedo´s and Asturias` most precious buildings and declared a World heritage site by UNESCO. King Ramiro I ordered the building work in 848 and used it as a Royal palace; subsequently it was to become a church. The base of the edifice is rectangular with two floors, both with a central section and two shorter side sections. The whole building is covered by a barrel vault, except for the side rooms of the lower floor, that are covered with wood. On the altar that lies outside the temple, there is still an inscription that dates back to the 23 June 848. The barrel vaulted crypt is divided into five different chambers by several arches, with its vaulted hall that looks out onto the outside world thanks to its arched viewpoints.